Ben Dolnick, courtesy of his website. Photo credit Michael Lionstar. One of my favorite things that has come from writing this blog is the great fortune I’ve had to interact with authors after I’ve read their books (and sometimes even while I am reading them). Luckily, authors answer my emails and tweets, and they take time from their busy lives to answer my questions and indulge my amateur theories about their books. 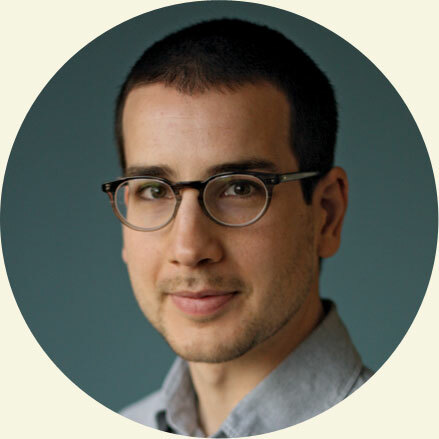 This time, Ben Dolnick, author of At The Bottom Of Everything (reviewed here) responded to my questions with some fascinating and very satisfying answers. They really enhanced my understanding of the book, and were a lot of fun to read. Thanks, Ben, for taking the time and sharing your thoughts. Q: I’ve been noticing a lot lately that sometimes authors isolate their characters from modern conveniences like cell phones and computers so that they can make their characters truly “lost”. In At The Bottom of Everything, email plays a limited but important role. Did you think about how much access you wanted Adam and Thomas to have to email throughout the book? How did you decide when to let them communicate with others? A: That’s very interesting about authors having to cut their characters off from electronics — I’d never thought of that, but it makes a lot of sense, plotting-wise. There are those funny Geico commercials about Christopher Columbus having a speedboat, or Paul Revere having a cellphone: good for convenience, bad for storytelling (for which obstacles and misunderstandings are crucial). As for my book, I didn’t think consciously about cutting them off from modern means of communication (though the plot would certainly have worked differently if they could just have called each other in India). I did decide to include emails, because I liked the density of information they could convey and time they could cover. Also, and just as importantly, the standard style of email — the informality and relative brevity — provided a contrast I wanted with the main narrative of the book. Q: The part in India, when Adam goes in search of the cave… how did you research it? Did you go to India? To a remote village? To a cave? A: I have been to India, though I didn’t go specifically for research. What happened was, I was already working on this book — I wasn’t yet sure what country I wanted to have Thomas disappear to — and I happened to visit my brother, who was working for the Associated Press in New Delhi. Within hours of getting off the plane I think I realized: it would be very easy to get into deep trouble here. Q: You have an amazing eye for detail. You drop in little descriptions –of people, of objects, of sights – that seem random but are so uncannily accurate that whatever is happening becomes very real and immediate to the reader. Um.. how do you do that? I am in awe. A: Thank you! To the extent that there’s something that comes naturally to me about writing — and there are huge number of things about writing that I find bewildering and agonizing and impossible — it’s probably describing stuff. I have no idea why this is so, or what good it does me, but it is, for the time being anyway, one area in which my brain seems to fire away happily, so I don’t ask too many questions about it. Q: On a more serious note, around p. 214, Adam truly believes he is about to die. He starts experiencing “life flashing before his eyes”, but it is different from what he expects. Did you base this chapter on something that has actually happened to you, or did you conjure up what you thought he must have been feeling? (I guess that is what writers do…). A: No, happily, nothing like this has ever happened to me. I have, in I’m sure the ways that everyone has, felt myself in danger at various points — near-miss car accidents, standing too near a drop-off, etc. — so I think I probably just extrapolated a bit from what that sort of situation can bring up. But mostly it was just guess-work and a question of what felt right to me, for better or worse. Q: Why did you pick India as the setting for the second half of the book? The combination of chaos and spirituality? A: Yes, chaos and spirituality sums it up pretty well. Because my brother happened to be working there, there was also a certain amount of arbitrariness/serendipity in the book being set in India, but it ended up being very much in keeping with what I was after. Q: Who is the “real” Thomas – the one desperate yet lucid lying at the bottom of the cave, or the one from the hotel and the final email? A: I don’t know! I know that’s an unsatisfying answer, and if I were a reader of my book, rather than the writer of it, I would certainly expect me to have something more intelligent to say about it, but I really don’t think I do. Part of what I wanted to do in the book was to write about what it would be like if there were an actual, enlightened being alive today, and to some extent that I think the two Thomas’s you describe represent two phases of his development in that direction. Q: Ok, I have to know – have you read Elliott Holt’s You Are One Of Them, and have you two compared notes at all? Your books are so similar in many ways, and I loved them both. I keep imagining the conversations you two could have. A: I did meet Elliott at the Brooklyn Book Festival, and she seems so totally great that I’m delighted to have my book overlap with hers, but I actually haven’t read her book yet, and most of our conversation was about where we went to high school (we both grew up in DC) rather than anything literary. I’m eager to read it, though! Q: What can we expect next from you? More novels, I hope. A: I’m still in that early phase of sorting out the shape and direction of my next book — it feels like a very prolonged period of dating someone, getting to know their personality and interests and etc. — but I’m hoping that we’ll commit to each other soon.